Elite Fitness has endeavoured to bring together the highest quality, most innovative range yet, the Elite 2016 Winter Cardio Collection. 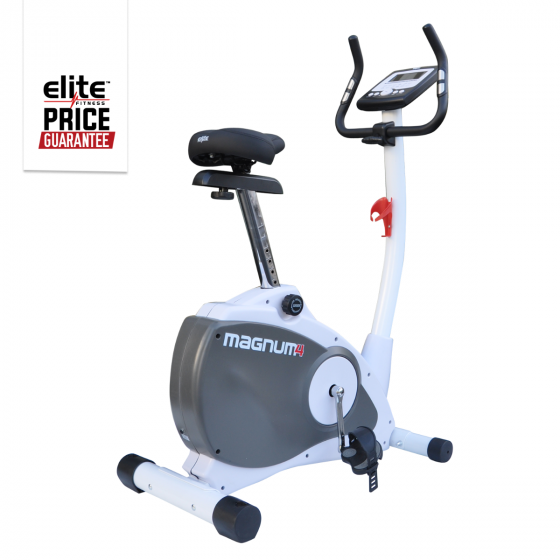 The Elite Magnum 4 Exercycle is a high-quality machine, produced at an affordable price to help you reach your fitness goals. With the Magnum 4, motivation comes easy! 16 levels of Silent Magnetic Resistance, 16 workout programs and a Heart Rate fitness program will be at your fingertips, keeping you inspired. The LCD Console keeps you informed as you exercise, offering valuable workout statistics including Time, Speed, Pulse, Calories burned and Distance. View your Heart Rate in an instant by placing both hands on the Grip Sensors and stay hydrated whilst you sweat thanks to the convenient water bottle holder, placed below the console. The Magnum 4 has a strong frame that can carry a maximum load of 120kg. The Adjustable seat height and distance gives the Magnum the ability to cater to a wide user range. When not in use the Magnum is easy to store away with built-in transport wheels.